Enjoy one of Ithaca's secret waterfalls, with a 150ft cascading fall that plunges into Cayuga Lake. 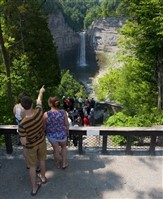 Enjoy a picnic lunch at the beautiful Taughannock Falls State Park. Experiance a wide array of some of Finger Lakes finest wines at American Vineyards. Discover Cayuga with a 2 hour boat ride tour on the Southern end of Cayuga Lake. We will make a meal stop enroute home.